1. Running produces breathlessness, and breathlessness produces the inability to think clearly. How can they properly take vital signs or get the correct drug dosages if they are out of breath and can’t focus their whole attention on the patient? 2. Running can cause a medic to trip and fall. How can they help their patient if they fall and injure themselves? 3. Running in with only the drug box and without the equipment needed to start the IV’s that ADMINISTER the drugs is not very helpful. How can they provide proper care if they don’t have all the pieces they need? The key to proper care is to remain calm and in control of the situation; to stay focused. Running will not help them do that. 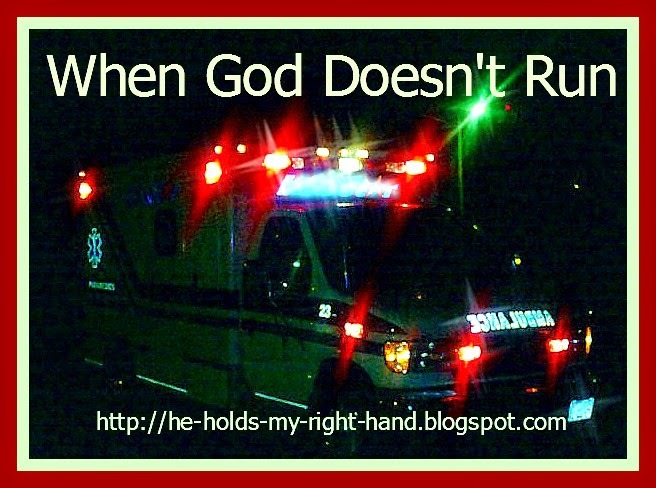 Usually, when we are hurting, we want God to run to us and rescue the day. We want him to hurry up and fix what is causing our pain. When he doesn’t help us as quickly as we think He should, we may begin to think He doesn’t care about us. But, the fact is, He has promised to give us all we need - but in HIS TIME, not ours - and sometimes that means we have to wait. When God doesn’t run, its because He knows what is best for us. We need to realize we don’t have all the facts. We don’t know all the behind-the-scenes work that is going on in our lives. HE DOES! When God doesn’t run, its because He may be waiting for all the pieces to come together that will provide us with the insight, guidance, and strength we need to continue on our journey as Christians. When God doesn’t run, its NOT because He doesn’t care. Its because He is remaining calm and IN CONTROL of the situation. Trust in Him. You are in the best of care when you are in the care of His loving hands. Excellent and oh so very true. I loved this post!! I would have been the one to run to the emergency. I loved how you tied something that had to do with your husband's life and gave it a spiritual lesson.